"So in every department, if you want to take education in a particular line, you have to qualify yourself to enter that school or college. Similarly, if you want to study Bhagavad-gītā, then you have to become a devotee. Simply academic educational qualification will not help you, because it was spoken to the devotee. Kṛṣṇa says that 'That very ancient science of relationship with the Supreme is today told by Me to you because you are My devotee.' So how the nondevotees can understand? Nondevotee cannot understand. And who is a devotee and who is a nondevotee? Devotee means one who accepts the supremacy of the Supreme Lord, and he is convinced his eternal relationship with God. Just like Lord Jesus Christ. He was threatened with death punishment. He was crucified. Still, he was convinced his relationship with God. Here is a devotee, example of devotee. Devotee means he is firmly convinced about his relationship with God. And what is that relationship? That relationship is on the basis of love. The devotee loves God, and God loves devotee. This is the only relationship. That's all. God is after devotee, and devotee after God. This is relationship. So one has to establish this relationship. 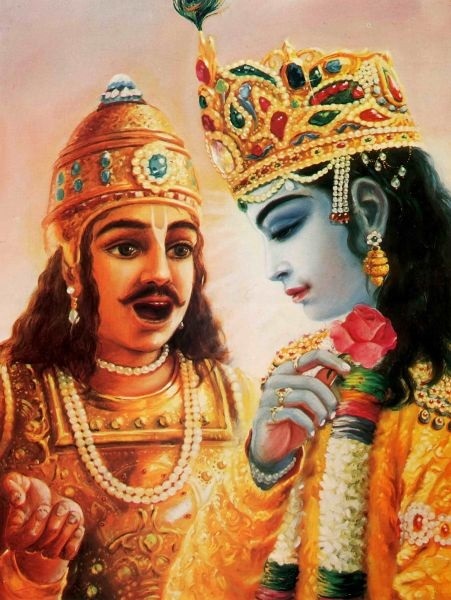 Just like Arjuna is in relationship with Kṛṣṇa as a friend, similarly, you can be in relationship with God as a lover. You can be in relationship with God as master and servant. You can be in relationship with God as father and son. There are so many relationships. As we have got relationship within this material world, this is only perverted reflection of that five relationship with God. But we have forgotten that. This Kṛṣṇa consciousness movement is to revive that consciousness. It is nothing new. It is just to bring an insane man to the normal condition of life. To forget God means that is abnormal condition, and to have relationship with God is normal condition. So Kṛṣṇa consciousness means to be reestablished in our normal condition of life."